Dr. Bari dental clinic is serving the best service among all the dental clinic in Pune since the past 35 Years. Our dental unit is the youngest addition to family and boasts of an ultramodern setup committed towards providing the best in class dental treatments at reasonable costs in Pune. Dr.Pranjal Bari is the best dentist in Pune. Personalised patient care is what distinguishes us from the rest. We provide quality services in Dental Implants, Cosmetic dentistry, Root canal treatment, Pediatric dental care and Temporomandibular joint disorders. We specialise in CAD-CAM all ceramic crowns and bridges, esthetic laminates and veneers, full arch implants and Denture, Dentist in pune. For our patients’ safety, we follow a thorough infection control through a strict sterilisation protocol and a round the clock physician support. 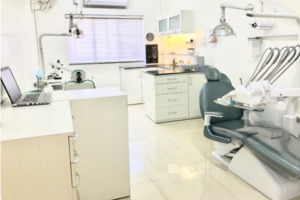 The environment of Bari dental clinic in pune has always been oriented towards quality patient care with highest standards of hygiene and stress free treatment experience.We aim at providing the most effective, painless, world class services using advanced equipment, graced with personal care in a friendly environment.